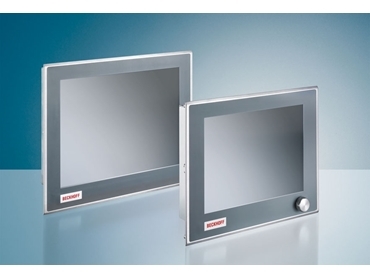 BECKHOFF Automation adds a new range of stainless steel built-in panels to their mounting arm panel PCs and control panels. The stainless steel design flush-mounted built-in panels comply with the stringent requirements of the food, packaging and medical industries. The built-in panel PCs of the CP62xx series and the built-in control panels of the CP66xx and CP69xx series are optionally available with stainless steel front and flush-mounted touch screen. Processor choices for the CP62xx series panel PC include Intel Atom, for example, which enables configuration of a fanless panel PC thanks to low heat dissipation. BECKHOFF’s built-in panels in stainless steel design are available as standard in quantities as low as one. The largely gapless finish prevents moisture deposits and contamination, making them ideal for cleanroom environments. Available in 5.7-, 12-, 15- or 19-inch versions, the built-in panel can also be supplied with a custom front laminate that enables flush mounting in control cabinets. The built-in panels in stainless steel design offer versatile application options, ranging from simple panels to complete control hardware in conjunction with TwinCAT automation software, with the same dimensions as the existing models. The stainless steel built-in panels as well as the stainless steel mounting arm panels in IP 65 protection are very compact, robust and customisable. The 12-, 15- and 19-inch built-in panels can optionally be equipped with an IP 67 USB port. Custom adaptations such as a modified front laminate are also possible.